Summary of Case: The Mobile archdiocesan VAC was contacted, apparently in late 2013, by a man alleging that Savoie had engaged in ‘inappropriate sexual conduct’ with him as a boy aged 16-18 in about 2005 at St. Lawrence church in Fairhope AL. An archdiocesan lawyer contacted county district attorney in 12/13 and 1/14. The DA did not investigate because at age 16, the accuser was beyond the AL age of consent. The age of consent specified in the current Vatican Norms (Art. 6 §1) is age 18. The archdiocese did not place Savoie on leave, and it is not known whether AL child protection officials were notified. The archdiocese reportedly investigated by 2/16/14, when Savoie announced to parishioners that he had been accused, that he ‘adamantly denied’ the allegation, and that as the archdiocese ‘has determined that there is no evidence to support the accusation,’ he ‘will remain serving as pastor of St Pius X,’ where the principal of the grammar school reports to him. In Savoie’s 9/30/14 deposition in a case accusing him of ignoring bullying complaints at the St.Pius X school, he stated that the Fairhope boy was working part-time at St Lawrence. Archbishop Oscar H. Lipscomb (1980-2008) 2001 St. Dominic Mobile AL 1/2. Priests were Msgr. Francis C. Murphy and Rev. Johnny S. Savoie, with Deacon Edward Connick. In 1996, Murphy became pastor emeritus, still residing at the parish, and in the 1998 Directory, he begins to be identified as a priest from Ireland. Rev. William J. Skoneki, a diocesan consultor and director of the Catholic Charities Appeal, became pastor. In 1998-1999, Rev. Charles J. McCabeis listed as a third priest. Archdiocese of Mobile. Parish school had 547 students in 1995-1996. Principal was Mrs. Ann Zimlich. Catechesis Program had 110 students in 1995-1996. 2001 2003 Shrine of the Holy Cross Daphne AL 1/1. Savoie was the pastor and sole priest. In 2002, Deacon Joseph McGonagle arrived. Archdiocese of Mobile. 2001 2003 St. John's Bromley AL 1/1. Archdiocese of Mobile. St. John's is listed as a mission attended from the Shrine of the Holy Cross. • Savoie was accused in early 2014 of sexual misconduct during this assignment with a boy age 16 to 18. See also Savoie's 2/16/14 statement and his 9/30/14 deposition. AL 2/2. Priests were Rev. Gordon Milsted and Savoie, with Deacon George W. Yeend, Jr. In 2006, Rev. Steven T. Williams replaced Milsted as pastor. Archdiocese of Mobile. Catechesis Program had 225 students. 2003 2008 Sacred Heart Battles Wharf AL 2/2. Archdiocese of Mobile. Sacred Heart is listed as a chapel attended from St. Lawrence. Archbishop Thomas J. Rodi (2008-present) 2010 Annunciation Monroeville AL 1/1. Pastor and sole priest. Archdiocese of Mobile. Catechesis Program had 39 students. 2008 2010 St. Joseph's Camden AL 1/1. Archdiocese of Mobile. 2008 2011 Alabama Southern Community College – Newman Center Monroeville AL 1/1. Chaplain. Archdiocese of Mobile. 2010 2011 St. Philip Neri Belle Fontaine AL 1/1. Pastor and sole priest, with Deacon James L. Scott. Archdiocese of Mobile. Catechesis Program had 41 students. 2010 Archdiocesan Tribunal Mobile AL Advocate. The Judicial Vicar was Msgr. James S. Kee. Archdiocese of Mobile. 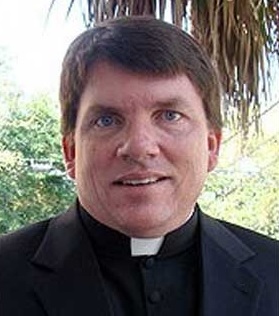 • On 2/16/14, Savoie announced to St. Pius parishioners, but did not state in the church bulletin, that he had been accused of abusing a boy during his Fairhope assignment, that he adamantly denied the allegation, that the archdiocese had found no evidence, and that he was staying. The archdiocese had not removed him during their investigation. Questions have been raised about whether the archdiocese has complied with the law and church procedure in handling the allegation. AL 1/2. Priests were Rev. Johnny S. Savoie and Stephen G. Vrazel, with Deacon William L. Tew. Archdiocese of Mobile. Parochial school had 369 students in 2011-2012, with Principal Mrs. Lauren Alvarez. Catechesis Program had 25 students in 2011-2012. Source: Official Catholic Directory (Kenedy: 1996-2014). This assignment record collates Savoie's career history as it is represented in the Official Catholic Directory with an allegation described by him in a 2/16/14 statement and discussed in a 9/30/14 deposition. We make no representation regarding the truth of the allegation we report, and we remind our readers that the U.S. legal system presumes that a person accused of or charged with a crime is innocent until proven guilty. Similarly, individuals who may be defendants in civil actions are presumed not to be liable for such claims unless a plaintiff proves otherwise. Admissions of guilt or liability are not typically a part of civil or private settlements. For more information, see our posting policy. This assignment record was last updated on 3/22/15.